Marketing Information: Bogen models TPU35B, TPU60B, TPU100B, and TPU250 are wall-mounted telephone paging amplifiers rated at 35, 60, 100, and 250 watts, respectively. All models can also be rack-mounted. 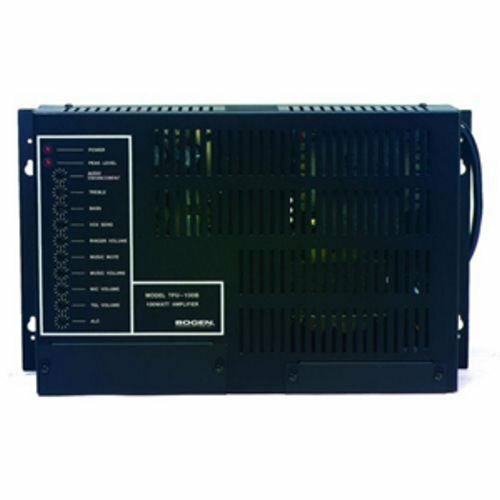 These TPU amplifiers permit paging from telephone and/or microphone; music input through an RCA jack or screw terminals; and voice-activated, variable level, music mute with fade back after page. These TPU amps include a night ringer which sends an electronic ringing tone signal through all speakers, alerting personnel of incoming calls. Jacks are also provided to bridge two TPU amplifiers to double the number of inputs and output power.